WHERE did the warm weather go?! this beach bum is miserable :( we went from 60F+ one day to wind chills in the teens the next! the weather this winter is bizarre. we had a balmy Christmas... such a change from last year's blizzard! eesh... i'm putting in a formal request for the warm weather to return. i'm so excited to bring you guys the first blog of the winter 2011 Finger Paints Special Effects collection available now (January 2012) at Sally's... which is FLAKIES! like most polish fanatics, i can't resist a flakie... true confession... just the thought of flakies makes me drool a little :) i'm layering it over polishes from the OPI Russian collection from a few years ago, it was a special request from my love, Dawn! today is OPI Russian Navy over Finger Paints Flecked. 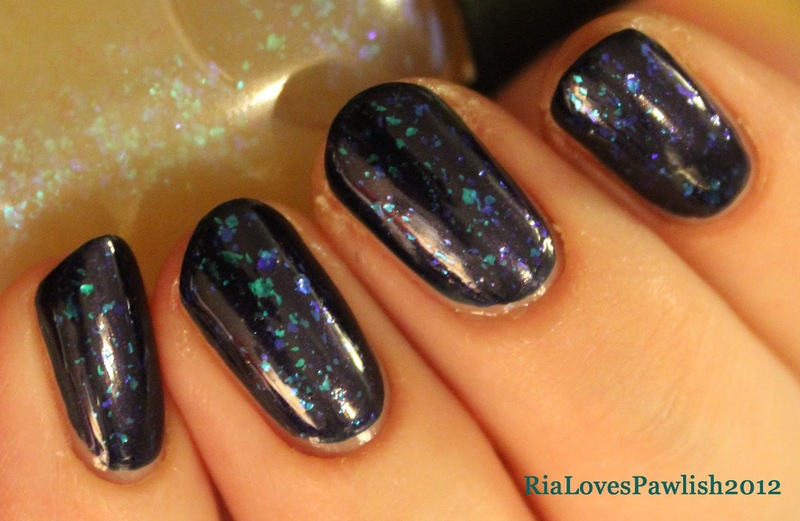 RN is a delicious dark blue that shimmers in direct light. fantastic formula, completely opaque in two coats! Motley has soft blue and green flakies, they change color constantly... distracting because all you want to do is sit and roll your hand around to see all the gradients of color! 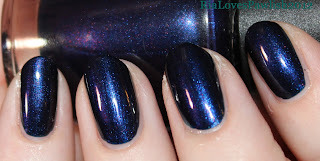 this is two coats of Russian Navy topped with one coat of Seche Vite. and here's one coat of Motley topped off with one coat of Seche Vite. there are five polishes in this collection which i will be swatching over the next few days... tomorrow is Asylum layered over OPI Catherine The Grape! Finger Paints Twisted over OPI Suzi Says Da! OPI The "It" Color with OPI Crown Me Already!